If you’ve been searching for the latest balance transfer offers from Discover, you’re in the right place, or rather, on the right page. Listed below, you’ll always find the most current and up-to-date credit card balance transfer offers from Discover. Discover it Cash Credit Card – 0% introductory APR for 14 months on purchases and balance transfers with a 3% balance transfer fee and no annual fee. Discover it Chrome Gas & Restaurant Credit Card – 0% intro APR for 14 months on purchases and balance transfers with a 3% balance transfer fee and no annual fee. 2% cash back at gas and restaurants once you pay off that balance. NHL Discover it Card – 0% intro APR for 14 months on purchases and balance transfers with a 3% balance transfer fee, no annual fee, and 10% off NHL gear once your pay off your transferred balance. Discover® More Card – No Balance Transfer Fee! (expired) – 0% APR on both balance transfers and purchases for 12 months with no fees of any kind! Discover® More Card – 18 Month Promotional Balance Transfer (expired) – 0% APR for 18 months, no annual fee, and a 3% balance transfer fee. Unfortunately, they got rid of their no fee offer along with their lengthy 18-month introductory APR offer. These are the best and only balance transfer offers from Discover currently – be sure to check in often as the offers may change frequently. Discover has some of the best balance transfer offers around, including their popular no fee balance transfer, which is typically offered during the first quarter of every year. So if you happen to have expensive credit card debt with other credit card issuers, the best time to transfer that debt to Discover is from January to March of every year. The offer could come around at other times of the year, but it tends to be a first quarter special. In fact, it was next to impossible to find a 0% balance transfer with no fee until this special deal was unveiled after the New Year. The Discover no fee offer hasn’t surfaced in the past couple years so it may be gone for good. But if it returns, I’ll be the first to let you know! I wouldn’t be surprised if it reappeared at some point. With just one click, you’ll be able to see the available balance transfer offers tied to your card. I currently have a 0% APR 12-month balance transfer offer in my account. If interested, you just click on “Select Offer” and you’ll be presented with a form to fill out, including the account number, creditor name, and amount you want to transfer. So it’s not just limited to credit card balances, which can come in handy if you have other high-APR debt you want to get rid of in a hurry. By the way, Discover does give you the option to deposit a promotional balance transfer check directly into your checking account, but you cannot do this online. You’ll have to wait for the checks to arrive in the mail, if they do happen to be sent to you. If you have a savings accounts with Discover, you might also receive balance transfer offers from the company, so that’s another way to get targeted. 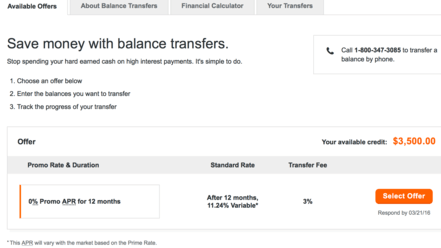 Discover also has a cool balance transfer calculator you can use even if you don’t take them up on one of their balance transfer offers. After selecting the balance transfer option simply click on “Financial Calculator” and you’ll be able to enter in your existing credit card debt and APR. It will then estimate how much you’ll save by moving your debt to them. In the screenshot above I entered a hypothetical APR of 20% on a $2,000 balance. If I were to go with the 0% APR offer from Discover I would save roughly $330.92 over 12 months. The cool thing is it actually factors in the balance transfer fee too, instead of just the interest to give you the entire picture. And you get to see what your minimum monthly payment will be. If you need more time to pay off your debt, consider the 18-month 0% APR promotional balance transfer offer instead. The Discover balance transfer fee is 3% of the amount of each transfer made under the offer and with the linked application, but you get a full year and a half to pay off that pesky debt and avoid hefty finance charges. This makes it one of the longer 0% APR balance transfers available today. Also consider that balance transfers can only take place between two different credit card companies (you can’t balance transfer within the same bank). So a Discover balance transfer may be perfect for the many Citi and Chase cardholders who have racked up unmanageable credit card debt. For the record, a Discover balance transfer would work with any other credit card company, like American Express, Bank of America, Capital One, or HSBC, so it’s a good option for the consumer who has credit card debt with one of those companies and needs a new company to assume it. For example, if you have a $2,000 outstanding balance on a Bank of America credit card, transferring it to a Discover credit card would be an option since they’re different banks. Discover balance transfer time: If you apply for a Discover balance transfer, know that it can take up to 7 days to get processed. It can take 14 days if you make the request when you open a new account, such as on the new card application. So be patient and keep an eye on any minimum monthly payments due. They say it can take longer if they have to issue a paper check (instead of remit electronically) to the financial institution you’re paying off. You can check status by calling Discover directly from the number on the back of your card. Also note that Discover recommends you wait to know your credit limit before making a balance transfer request to ensure you stay within your limit, and ideally, at or below 30% of your limit to avoid any unnecessary credit dings. But you should be allowed to transfer any amount up your limit with Discover, including the balance transfer fee, if applicable. That being said, Discover will sometimes dole out some pretty low credit limits relative to other credit card issuers, depending on your credit score. So it can be wise to wait to see what that limit is before transferring a balance. The good news is they often accept applicants with credit scores in the mid-600 range, depending on other attributes, making them a card issuer you shouldn’t pass up in your search.